No, not the town in New York, the little cartoon bird who skates on frozen ponds. That time has arrived here as on many mornings this past week the little birdbath in the back garden has offered up a solid surface. It is somewhat sad to see but inevitable. The magnolia tree, Magnolia macrophylla, has lost its very large leaves and the hosta leaves have either turned to mush or skeletelized as the season progresses. Little remains of the summer garden and fall has packed up and left even though the calendar gives us another month. Mother Nature rarely looks at the calender though. This year the witch hazel has put on quite a show. This was planted as a Hamamelis 'Arnold's Promise' but most retail witch hazels are grafted to more sturdy rootstock and this graft failed. It has reverted to that rootstock, the native Hamamelis virginiana which blooms in fall rather than spring. H. 'Arnold's Promise' would be the first tree to bloom here in the spring but the H. virginiana is the last to bloom here and it is as welcome a sight. There are other bits and pieces of color if one takes the time to really look. The hellebore is poised to bloom. It sits in suspended animation now and will stay at this stage during the cruelest days of winter. If the snow recedes these lime green buds are visible and a reminder and a promise of future blooms. For now, this little viola sits shivering in the cold. It would be overlooked if it were blooming when blooms abound but now, in the low light of late fall, it glows in the crack of the walkway. It seems to me to be a miracle in miniature. In May, the question is not 'what is blooming' but 'what is not' which seems more appropriate. It has been a very cool spring which has been easy on the flowers. They last much longer with cool temperatures and while many plants are blooming a bit later, there is more overlap of bloom and more time to appreciate those blooms. The crabapples are blooming and none is prettier than this 'Prairie Fire' above. I love the lipstick magenta color along with the subtle scent of the flowers. The Carolina Silverbell is blooming as well. Its white bells light up the garden it is shading. Fothergilla has a curious flower, don't you think? Lime green shows in the buds and they mature to a soft creamy white. Moving to ground, the bleeding hearts are off and running. I moved several white ones from the woods where there were seedlings growing. Borne on the wind or carried by creatures, these seeds germinated twenty feet or so from the garden bed of their parents. They seem happy next to the forget-me-nots which were gifted to me by my neighbors, The Dynamic Duo. Camassia are showing their blue in the 'Stonehenge' garden. They have been inundated with other perennials and a bit of cleanup will soon be necessary. The tulips and daffodils are fading but with such an abundance of bloom they will be remembered fondly. Thank you to Carol of May Dreams for hosting another Bloom Day. I do hope to visit your garden via her links. Do you have a favorite bloom for Bloom Day in May? In the midst of a garden full of ornamental plants, this native oak blooms. Oak blooms often go unnoticed since their bloom time overlaps that of tulips, bleeding heart and some of the other show stoppers. But like a baby with perfect fingers and toes, the small oak leaves look soft and fresh and well worth a caress and a second or even third glance. Another reminder from Mother Nature to pay attention. Fall Foliage, seven sons and a spider! Fall scene in the back yard! After one light frost we are back in the warmth. Today the morning temperature was decidedly balmy! 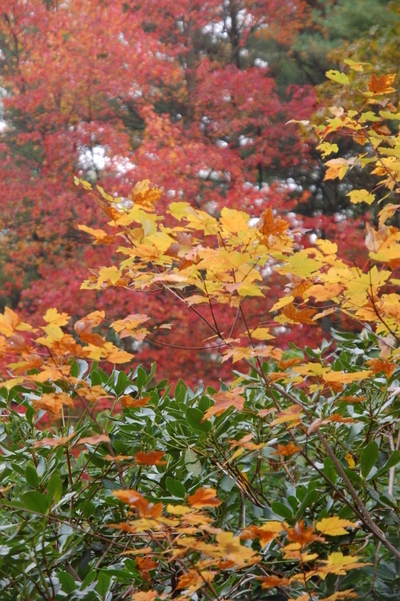 This is the shot of the foliage in the back yard. 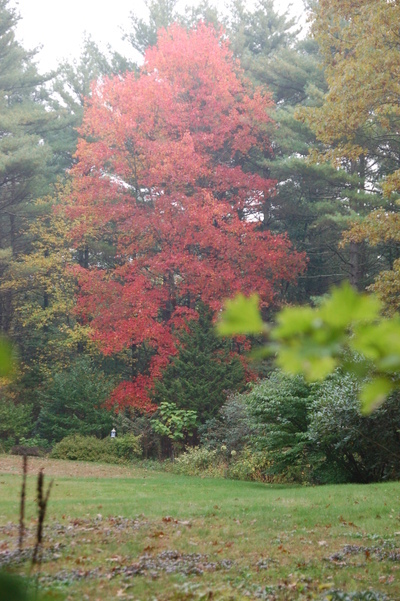 I have one swamp maple, aka red maple, Acer rubrum, which always provides a good deal of color in the back yard. Here are two pictures with different focal points. 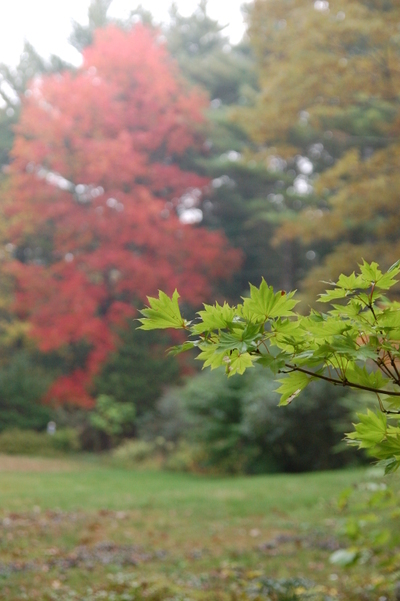 It is interesting to see the camera perspective as it focuses first on the red maple and then on the Acer shiraswanum aureum or Golden Full Moon Maple which has not yet started to turn color. The foliage of the Full moon maple is beautiful all season. Forgive the lawn, I currently have a totally organic approach to it. It can live or it can die and it usually lives with a bit of ajuga in the mix! 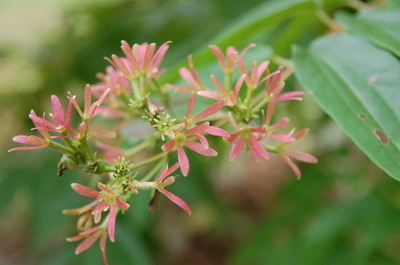 The bracts on the Heptacodium miconioides. Seven Sons Flower, are coloring up. This tree, as mentioned in a previous post, has four season interest with beautiful bark, lovely white flowers and then this color surprise. I don't have a great picture of the bark yet although it is starting to exfoliate as it reaches greater maturity. 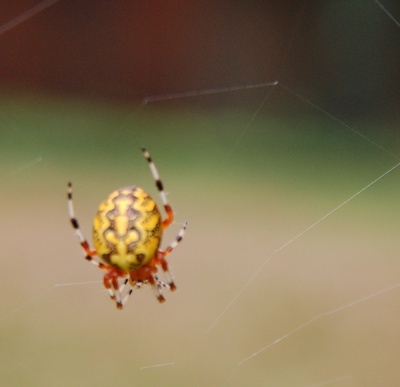 The next picture may give you the shivers if you do not like spiders! Be forewarned! 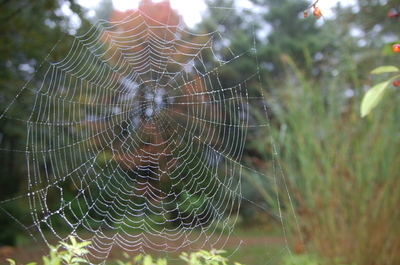 I found this web last week and today I just happened to walk by and saw the creator! I wondered where she was! The web must have sustained some damage in the past week. I am sorry that she is a bit blurry (Click to enlarge) but she was spinning and while I would like you to think she was really fast, hence the blur, that was not it! You can clearly see the web as it emerges from her rather rotund little bottom. Here she is again with brilliant markings. She seemed to notice my camera and she scurried for cover. 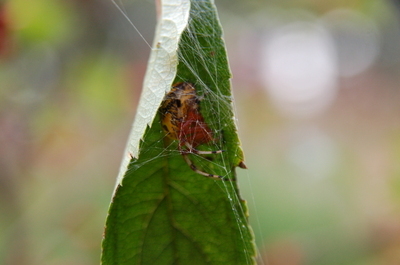 She is hiding in the crabapple leaf. It is a time for spiders isn't it! Do any of you know what kind this one is? 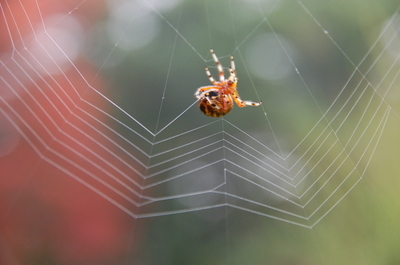 Do the females spin the webs or the males? I will have to look this up but maybe one of you can enlighten me! 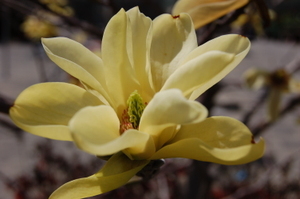 In wandering one of my favorite garden centers today, I came across a beautiful Magnolia 'Sunburst'. Magnolias come in a variety of colors, shapes and sizes. I have seen yellow magnolias before. 'Elizabeth' and 'Butterflies' have been available for quite a while but this one just lit up the corner at the garden center. What do you think? 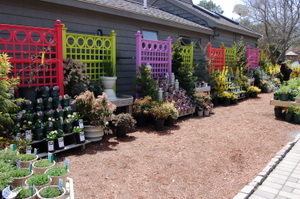 Pictured here is a display area for new varieties of perennials. You know the patented ones which are three times the price of last year's model. Only time will tell if the product is worth the price but it sure is a pretty display spot.